VEVOR Commercial Ice Cube Maker is portable and looks great in all stainless steel with a beautiful simplistic yet modern design. 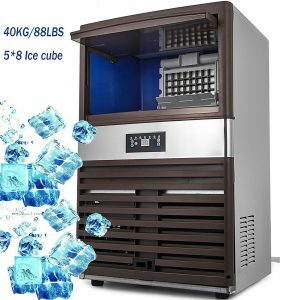 This standalone ice maker is offered in three formats with different ice production capacities of 121lb., 88lb, and 99 lb. per 24 hours. And the R134a compressor power for each of these 110-120V, 60Hz units is 350 watts, 180 watts, and 300 watts. It can be used in a variety of commercial settings including bakeries, bars, snack bars, hotels, restaurants, grocery stores, cafes, and homes. 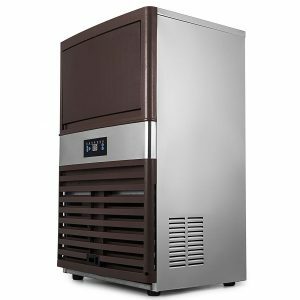 Vevor Commercial Ice Maker first appeared on Amazon.com at the beginning of May 2018 and we don’t have many customer ratings yet. But it scores 4.5/5 stars on the day of this review. You can adjust the thickness of the ice through the practical control panel between thick, middle and thin. Thick ice will be produced within 11 minutes to a quarter of an hour, middle size in 8 to 11 minutes and thin ice in 5 to 8 minutes. And it has a 39-pound size bin capacity. This is generally a high production capacity ice cube maker that can make up to 88 pounds of ice each day. The overall ice making cycle is specified as 12 to 18 minutes. The R134a refrigerant works without making much noise despite being quite powerful and efficient, cooling very rapidly. There is a rather practical and functional control panel that is rather easy to operate, with an LED screen, lights that show the current status and different buttons for self-cleaning and other useful functions. It is made of food-grade solid ABS plastic and stainless steel that is resistant to rusting and does not need to be serviced frequently- is easy to maintain. It has no additional coloring or strange odors and does not contain any chemicals that may potentially bad for your health. The unit will start producing ice straight after being connected and will get into preserving ice when the 39 lb capacity bin is full thanks to its great insulation. The hard and cubic shaped ice produced by this unit measures 0.87 x 0.87 x 0.87 inches and can be adjusted to three different sizes. Vevor Commercial Ice Maker is easy on the eyes, looks good in stainless steel and has a stylish black front panel. In each cycle, it will make an average of 5 x 8 = 40 cubes of ice. The unit weighs 66 pounds and measures 20 x 16.5 x 32 inches. Please make sure that the plug from the front control panel is connected to the power outlet or the operation may be affected. It is easy to set up and operate with the easy and clear instructions and will start making ice straight after being cleaned. It is a great quality product that we recommend to anyone with the right budget.